A Labour councillor has been given a formal warning after he tweeted that allegations of anti-Semitism in the party were a plot by Jewish Tories. Salford councillor Mike Pevitt, who represents the Claremont ward, has since deleted the tweets and apologised. The Conservative opposition have reported Mr Pevitt, alleging that he breached the council's code of conduct. The North West Labour Party refused to comment. But a spokeswoman did confirm that a formal warning had been issued by the party's National Executive Committee (NEC). 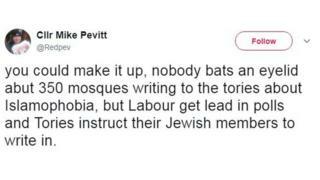 Mr Pevitt's tweet read: "You could make it up, nobody bats an eyelid about 350 mosques writing to the Tories about Islamophobia, but Labour get lead in polls and Tories instruct their members to write in." He has deleted the tweet and apologised for the comments. But Salford City Council's Conservative opposition has called for a council investigation into the tweet and have written to the authority's monitoring officer. Councillor Jillian Collinson, the party's chief whip who represents Boothstown and Ellenbrook, said: "The Labour Party can do what it likes, this is a breach of the council's standards. "It's not good enough - if anyone of our group said something like this we would be in big trouble." Fellow Conservative councillor Rabbi Arnold Saunders added that relations were good between the Jewish community and the Labour Party in Salford. On Tuesday Labour's NEC adopted an international definition of anti-Semitism following months of acrimony. Rabbi Saunders also said: "Salford's Labour-led council has already adopted this definition of anti-Semitism." The Labour Party said it takes all such complaints extremely seriously.